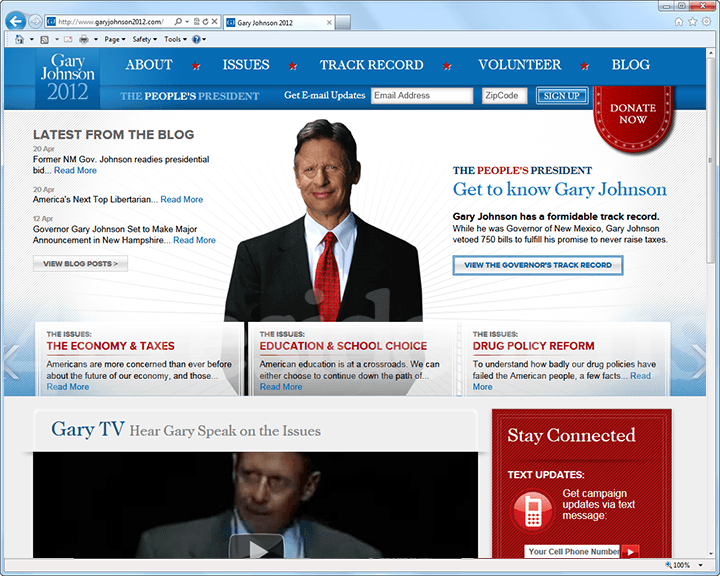 April 21, 2011, Concord New Hampshire - Former New Mexico Governor Gary Johnson today announced that he is seeking the 2012 Republican nomination for President of the United States. Johnson served as governor from 1995 to 2003. The announcement was made Thursday morning on the steps of the New Hampshire State House. Today’s mess didn’t just happen. We elected it -- one senator, member of Congress and president at a time. Our leaders in Washington, DC, have ‘led’ America to record unemployment, a devalued currency, banking scandals, the mortgage crisis, drug crisis, economic crisis, loss of our nation’s industrial might – and a long list of other reminders our nation is way off course. Why am I telling you this? Because America is better than this. And because I can help fix it. Before I was governor of New Mexico, I started a one-man fix-it business that I grew into an American dream with more than a thousand employees. My formula for success was simple. I showed up on time, did what I said what I’d do, and knew what I was doing. I did the same thing as governor, exactly. Within two terms, I’d eliminated New Mexico's budget deficit and cut the rate of state government growth in half while reducing the state workforce by over 10%, without laying off a single qualified state worker. Saying no to waste, corruption and political games is easier than you think. During my two terms I vetoed 750 pieces of bad, unnecessary and wasteful legislation, and used the line-item veto to save millions of dollars. I was called “Governor Veto,” and accepted that nickname proudly. America needs a ‘President Veto’ right now – someone who will say ‘no’ to insane spending and stop the madness that has become Washington. That’s why I am here today to announce that I’m running for President of the United States. And I don’t do so lightly. President Obama is about to raise and spend $1 billion in a reelection campaign to keep America on the track it’s already on. I would ask: How much more of this track can we stand? How much more financial stress can we handle? How high do taxes have to go? How much deficit is too much? How much more of the Bill of Rights do we have to lose before we say not just no, but HELL NO? It’s time to put one of our own in the White House. I have the qualifications, the ability and the know-how to do the job. I also have a track record. I’ll do what I say I’ll do. I look at the rest of the field running for president, and that song by The Who comes to mind. Meet the new boss. Same as the old boss. You know the one. We ‘Won’t Get Fooled Again.’ What’s the definition of insanity? It is to keep doing the same thing over and over, and expecting a different outcome. I’m ready for a different America. I’m ready for the day when a person can build a good life on a decent income, and we can take our government at its word – when people have more to smile about. I’m ready for peace and prosperity and some American dreaming. I’m ready for America to be AMERICA again. Our current president will not lead us there. None of the professional Washington set will. We have to get there on our own. I’m here in New Hampshire today because I can – and will -- do a better job for you as president. I’m optimistic about our chances. Winning freedom is what America does. Following the announcement, Governor Johnson will spend three days in New Hampshire meeting with supporters, visiting local businesses and on Saturday, April 23, hiking and skiing the well-known Tuckerman’s Ravine in the White Mountains.